The great outdoors come inside! 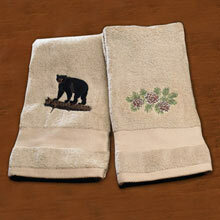 Nature inspired designs are embroidered on supremely soft, beige cotton/polyester terry. Machine wash. Imported. Specify Bear, Pinecone or Deer, all sold separately. 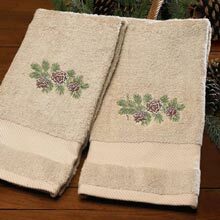 With the set of 3, you get one each; Washcloth, Hand Towel & Bath Towel. 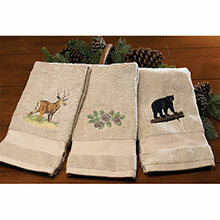 Specify Bear, Pinecone or Deer (sorry, no mix and match). 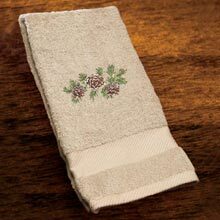 Hand Towel - 28" x 16"
Bath Towel - 54" x 27"